A good story will always find new ways to be told, and here’s proof featuring one of the most popular tales of the last 20 years. 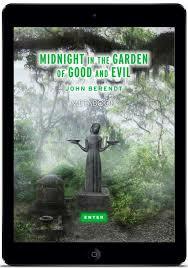 First, back in 1994, “Midnight in the Garden of Good and Evil” was a book. And not just a book, but a publishing sensation, selling millions of copies and pushing Savannah into the tourism stratosphere. Then came an audiobook, a lifeless movie by Clint Eastwood, and plans for a Broadway musical. Now, 21 years after John Berendt insisted on publishing it with no photos of its real-life cast and locations, “Midnight” is the first title of a multimedia iPhone/iPhad app called Metabook. The app is loaded with photos, text, audio clips – even an audio dramatization of the book with Laverne Cox of “Orange Is the New Black” voicing The Lady Chablis. The new version is for iPad and iPhone. He was joined on a panel by audio director Robin Miles and creative director Benjamin Alfonsi. They plan to produce a second non-fiction Metabook soon, augmented again with a tremendous volume of authentic source material. And Alfonsi promised a new novel by a famous American author will follow. The digital book app includes the “Midnight” text, a 3D rendering of the Bird Girl statue, bios and updates on the characters, and a panoramic view of Bonaventure Cemetery. It also has crime scene photos with Berendt’s commentary and audio recordings of central figure Jim Williams (played, not to Berendt’s pleasure, by Kevin Spacey in the movie). Will Metabooks catch on as a way to appeal to younger readers used to more interactive experiences than print or plain e-books? “Midnight” seems a good place to test the waters, given its enduring popularity and the wealth of extras that flesh out the story. It might bring in new readers and please fans who crave even more details about Savannah, Williams and his multiple trials for killing his young lover. 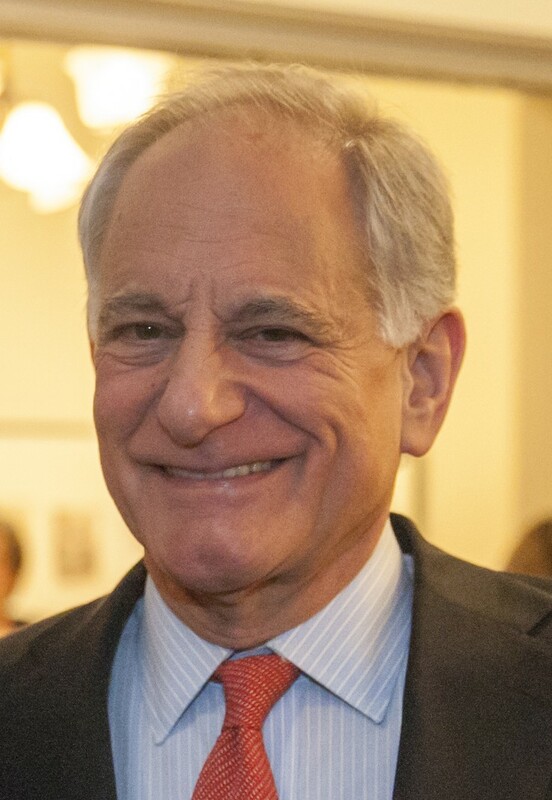 For Berendt, it now makes sense to add multimedia material (including those photos he objected to originally) because readers today can easily find the real thing online. That wasn’t an option when he wrote the original narrative, and he wanted them to rely solely on his prose for their mental images, rather than on snapshots in the middle of the print copy. “Midnight” spent 216 weeks on the New York Times bestseller list and sold some 5 million copies. Even the awful movie had an upshot: It paid for Berendt’s New York City townhouse. Could a publishing phenomenon like that happen today, Berendt was asked by moderator Richard Eldredge of Atlanta magazine. “It will be a wholly different shape,” Berendt replied. “It will never occur in the way it happened back then because bookstores were at the heart of it, and that’s not the case anymore. So I don’t know what the scenario will be, but there will be publishing phenomenon. “It’ll be much harder for a very small book to break out. On the other hand, there is this incredible digital revolution and the Internet, so something could go break out, something could go viral very quickly from small to big. This entry was posted in Atlanta, Entertainment, Social Media and tagged Books, John Berendt, Margaret Mitchell House, Midnight in the Garden of Good and Evil, murder, Richard Eldridge, Savannah, stories on March 6, 2015 by Jay Croft. “We don’t want bookstores to die. Authors need them, and so do neighborhoods.” — Roy Blount, Jr.
From Kurt Cobain to Flaubert… and lots more. 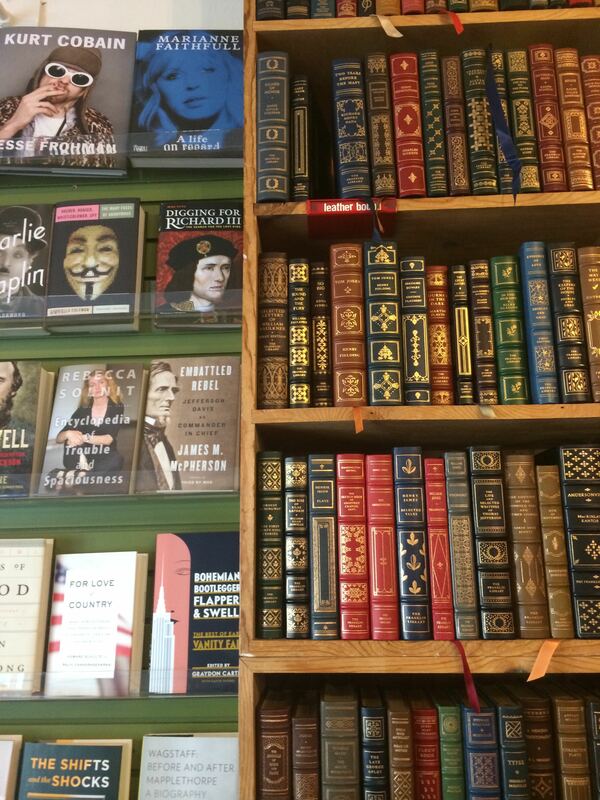 Like newspapers and the music business, bookstores everywhere have taken an evolutionary hit in the digital age. Many have folded up, including all the Borders chain and Atlanta’s Outwrite. But A Cappella Books continues to give bibliophiles reason to hope — and to spend money. 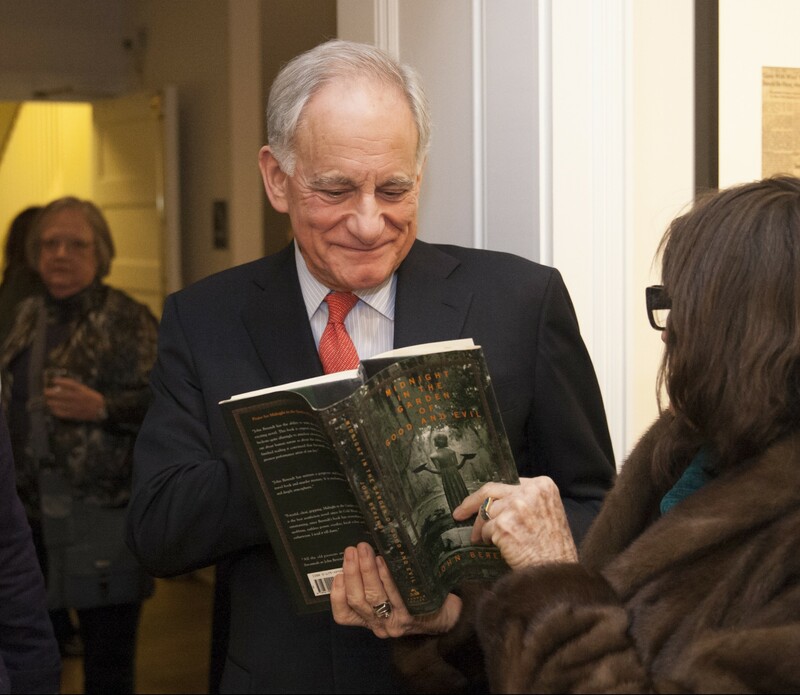 On Friday, the independent shop celebrated 25 years in business with a reception at The Jimmy Carter Presidential Library and a party afterward at Manuel’s Tavern. Throughout the years and changing marketplace, owner Frank Reiss has moved the store to a few locations in the Little Five Points/Inman Park area. He’s adapted nimbly from his original focus on hard-to-find and out-of-print books. Now he has added more online sales, more events with authors, and selling more signed copies. The first two locations were in the heart of Little Five Points, with heavy foot traffic and lots of stores and restaurants around. Now, he’s in a more isolated spot nearby that’s right up against busy DeKalb Avenue. Reiss has built the kind of goodwill that local merchants dream of. And it’s not just anybody who can score a presidential library and Manuel’s on the same night. When A Cappella Books first opened its doors in Little Five Points in 1989, there was no Amazon. For all intents and purposes there was no internet. Barnes & Noble had not even arrived in Atlanta. Oxford Books dominated the local retail book landscape, with another newcomer, Chapter 11, nipping at its heels. Only a few years later, Oxford had succumbed to its newfangled competition. In several more years, Chapter 11 was bankrupt. 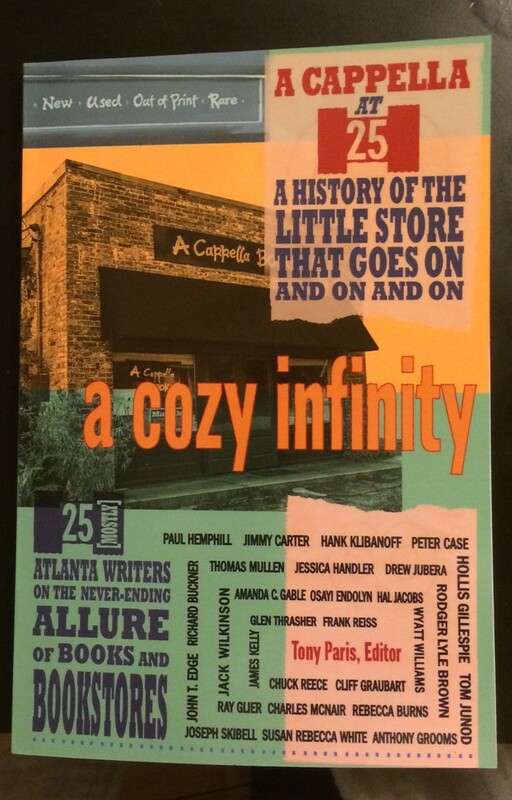 A quarter century–and three re-locations–later, A Cappella is still going strong, and, while still hardly bigger physically than its original incarnation, the little store plays a big role in the local literary scene, presenting important authors and selling books at venues all over town. Reiss ended up writing more of “A Cozy Infinity” than he had planned. “It’s where I tell the story of how I got into the book business and started the bookstore here in Atlanta and figured out a way to keep doing it for 25 years,” he said. The American Booksellers Association, which represents independent bookstores, says its membership grew 6.4 percent in 2013, to 2,022. Sales were up 8 percent in 2012, and those gains held last year, The Washington Post reported in an article citing a resurgence of independents. “There’s a lot of room for improvement, but not everything is doom and gloom for America’s bookstores,” reported The Open Education Database. In 2013, Publisher’s Weekly ranked Georgia as 18th among states for book sales. The state had 252 independent bookstores. Others that have made the most of their niche include Charis Books & More in Little Five Points, with a focus on women, and Little Shop of Stories in Decatur, which sells children’s books. 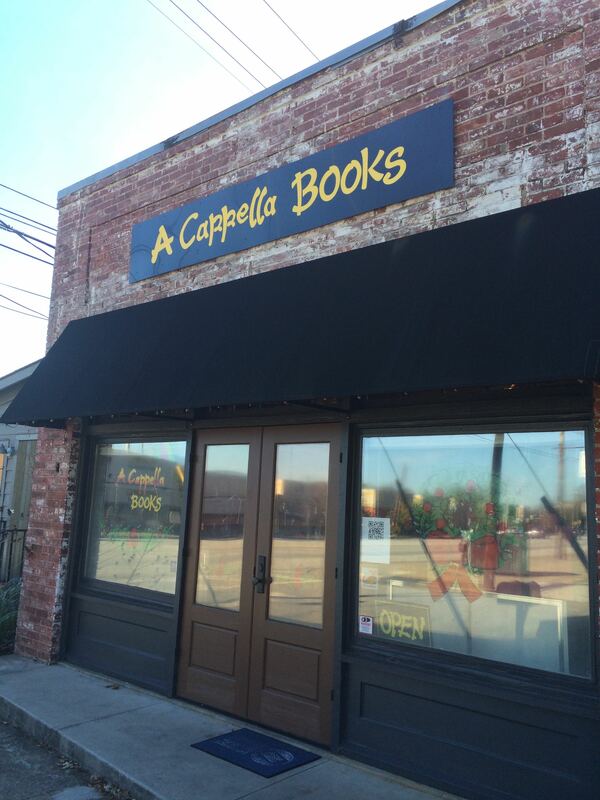 Let me know about others, and share your stories and support for A Cappella and other independent bookstores. At this time of year, when we’re all out there shopping, it’s good to keep local independent merchants of all kinds in mind. Thanks, Frank, for pulling that one off the shelf for me. This copy of “Huckleberry Finn” was printed just five years after the novel was first published. A Cappella previously focused on hard-to-find and out-of-print books, and remains a rich resource. O’Connor, Pynchon, Rushdie… You walk in looking for something and find three more books you want. My haul for the day. Two copies of “The Innovators” — one for me because I love the author, and one for my step-father, the retired rocket scientist. This entry was posted in Atlanta, Entertainment, Social Media and tagged A Capella Books, atlanta, Books, Bookstores, Frank Reiss, Hank Klibanoff, independent bookstores, Jimmy Carter, Jimmy Carter Presidential Library, Manuel's Tavern, Reading on December 8, 2014 by Jay Croft. 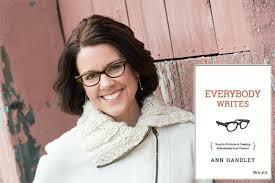 That’s when content-marketing expert and author Ann Handley won my heart. About halfway through her newest best-selling book, “Everybody Writes,” Handley lists the business jargon terms she most dislikes. I was enjoying her choices, since they mirror mine. The “Yeah, yeah — what she said” admiration I’d been developing through the book warmed as the list progressed. And when Handley concluded with “learnings” … well, that was it. I have a new girl-crush. Or in Twitter parlance, Handley is my first #WCW (Woman Crush Wednesday). A leading addition to the growing canon of books on content marketing/brand journalism/storytelling. A snappy guide to help people write better in the Strunk & White vein. And an endlessly valuable resource for anyone wanting to improve his or her communications skills, learn more about writing in today’s marketing context, and make sense of the various social media channels. Handley’s helpful, no-nonsense approach seeks to demystify writing, and she breaks it down into endless useful tips — from the basics to a wide range of content creation. As she points out, in today’s business world, “writing matters more… not less” and it’s a skill to be learned, not a rare talent that alights only the inspired. Her book will be a solid refresher for seasoned writers; helpful to print veterans navigating their way into digital; and most useful to non-writers who realize — or accept or admit — that they really do need to develop writing skills. Now that would be a learning. This entry was posted in Business Comms, Social Media and tagged Ann Handley, Books, Communications, Everybody Writes, Handley, writing on November 12, 2014 by Jay Croft. 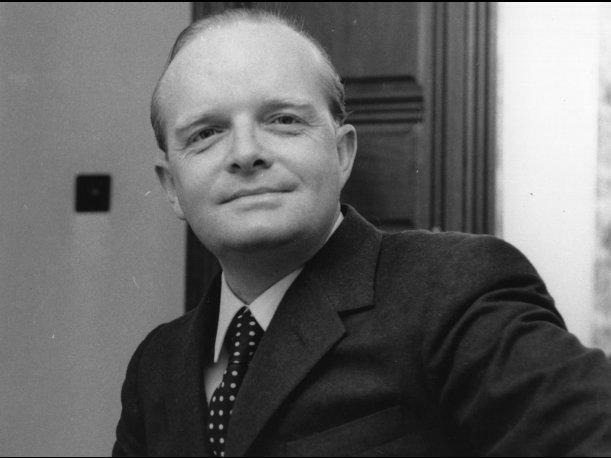 This week marks the 30th anniversary of Truman Capote’s death. He was just 59, but the decades of drinking and drugging made him look much older and pathetic when you’d see him on The Johnny Carson Show, silly and chatting away in that nasal, high-pitched voice. That book showed reportage as art. And one of his later books, “Music for Chameleons,” further jazzed me with Capote’s first-person tenderness and uniquely vivid descriptions. To celebrate the great words Capote left, here are nine segments and quotes that have stuck with me over the decades. And if you haven’t yet, do yourself a favor and read “In Cold Blood,” “Music for Chameleons” and “Breakfast at Tiffany’s” (and no, the Audrey Hepburn movie doesn’t count). 6. 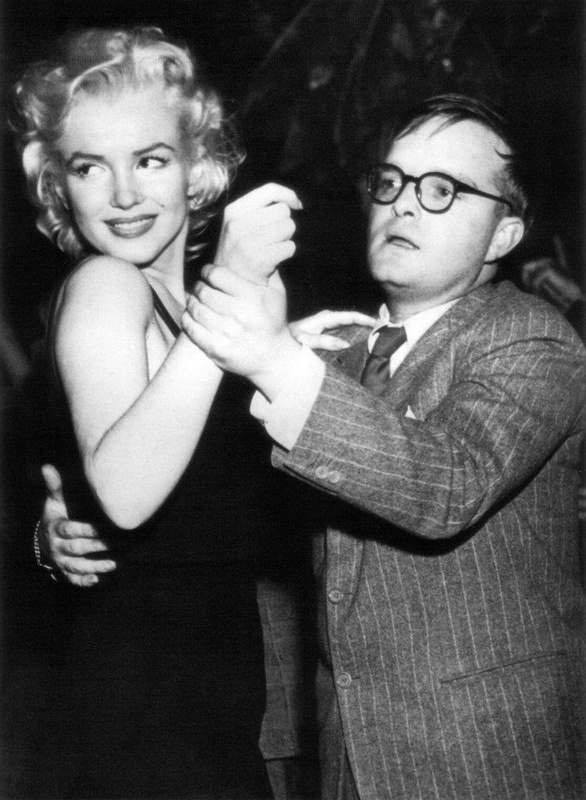 Marilyn: Remember, I said if anybody ever asked you what I was like, what Marilyn Monroe was really like—well, how would you answer them? (Her tone was teaseful, mocking, yet earnest, too: she wanted an honest reply.) I bet you’d tell them I was a slob. A banana split. Marilyn: I can’t hear you. TC: I’d say you are a beautiful child. 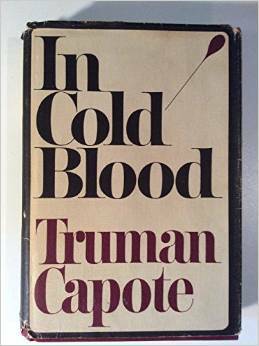 This entry was posted in Entertainment and tagged Books, In Cold Blood, journalism, novels, Truman Capote on August 27, 2014 by Jay Croft. 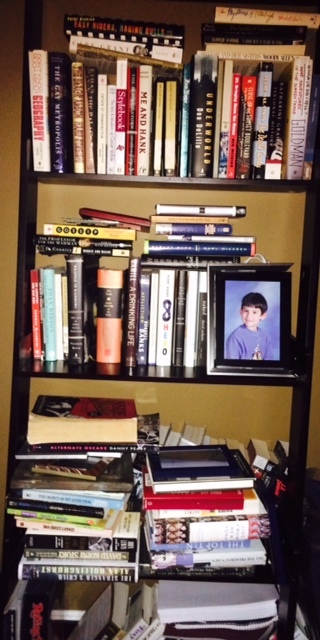 So many books, so little time… Sometimes I just go to one of my shelves and find something I haven’t picked up yet. For me, Donna Tartt’s divisive novel deserves only half the fault. But we’re both in the same place, stalled in trying to figure out what to read next. But each of us sheepishly admitted we weren’t enjoying this one, and we eventually gave up before page 200, or about a quarter of the way through. It was just such a slog, almost unreadable – and then we heard from more friends who had the same response. Micro-reviews of some of what I have been reading lately…. 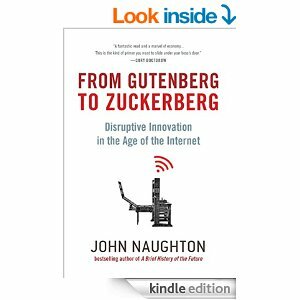 From Gutenberg to Zuckerberg: Disruptive Innovation in the Age of the Internet, by John Naughton. Sort of like a Malcolm Gladwell book, this traces the history of innovation, starting with that famous Bible all the way up to the most famous social network. Naughton draws fascinating parallels and shows how changes in communications lead to profound changes in everything. 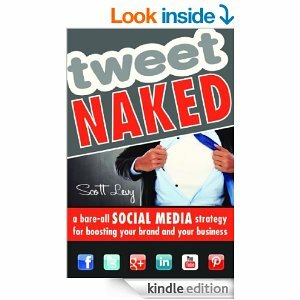 Tweet Naked: a bare-all social media strategy for boosting your brand and your business. Levy’s an engaging writer and this is a highly readable primer on getting started. The faux provocative title just means: Be transparent. 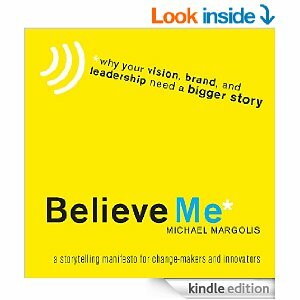 Believe Me: a storytelling manifesto for change-makers and innovators. By Michael Margolis. Short, smart, thought-provoking. And free online. Get it, read it over a cup of coffee, talk about it with a friend or colleague over a couple more. The experience left Tony and me both oddly unable to get back on track with something new. Tony says he’s baffled by reviews now, and I admit my attention span seems shot – challenged, at least – by my focus on digital communications and social media. So I asked Facebook friends, How do you decide what to read next? Is it reviews? Cover art? Oprah? Stephen Bell Miller: I troll bookstores, take suggestions from reviews or interviews I hear on NPR; I look to biographies and mystery series; and the classics are always on my list. Priscille Dando: Recommendation from someone I trust is the biggest influencer–friend, librarian, independent bookseller, reviewers at Booklist, publishing reps that know my taste. I do pay attention to Buzz books and awards but a book jumps the line if someone I know loves it. Scott Pierce: My latest was The Circle by Eggers. I got it at Church Street Coffee & Books (in Birmingham, Ala.) for two reasons: I’d read Eggers before and loved him, and I trust Carrie to stock great reads. Peter Rubin: I read a lot. They are cotton candy for the brain type books. If there is a CIA black ops, political intrigue, super spy thriller then I read it. If I like the author — then I binge read all his/her books. I know people who like the same types of books and ask them if I have run out of new ones to read. So, in essence, word of mouth from a trusted source. Kelly Pierce: I mostly pick books up and flip to a random page. If I like that passage, I buy the book. Not very scientific. Sometimes I get heads up from friends or hear or see an author interviewed that sounds interesting. Connie Ogle: Sometimes it’s something so simple as the cover or the description. … I read Fourth of July Creek recently and ended up reviewing it bc a colleague had suggested it. I do read reviews, too, of course, though I never trust Amazon reviews (what if it’s the author’s sister???) I get ideas from Twitter #fridayreads, too, and just looking at hashtags for books to see what people are talking about. Michael Van Ausdeln: For me, it’s reviews. NYT Book Review plus Amazon Best of the Month. Question: What was the problem with Goldfinch? I liked it thru the lens of grief. It was the reaction of seeing your mother die. It worked for me. Connie again: It wasn’t the worst thing I’ve ever read, The Goldfinch, but I only got about 200 or so pages through and was annoyed throughout. I swear, a book is set in NYC, and all the NYC literati lose their minds. Good grief. When I heard how it ended I was even more glad I bailed out. Phil Kloer: Goldfinch seems divisive. I thought it was amazing, Dickensian. Franzen is also divisive but I have loved his last two, I go by reviews (NYT, NPR, even sometimes Amazon), FB word of mouth, but in most cases the author’s track record. Cara Neth: My neighbors put up a little library across the street so I tend to wander over and grab whatever looks good when I want something new. I just read “Great Expectations” for the first time because it was there. Otherwise, I focus on working my way through the stacks of books that I’ve bought over the years and never got around to reading…I want to get through those before I read the latest hot novel. I thought “Secret History” was overrated, so I haven’t had any interest in “The Goldfinch”…but if it shows up in the little library, I’ll probably pick it up. This entry was posted in Entertainment, Social Media and tagged Books, Donna Tartt, Facebook, Goldfinch, Internet, John Naughton, Michael Margolis, Reading, The Goldfinch on July 23, 2014 by Jay Croft. I’ve been thinking about balance lately, and it’s come up several times in conversations at work, at home and on social media. I find that I’m happiest when I am able to manage several aspects of my life in a well-rounded way. But if I try to do everything all the time, it’s an unrealistic expectation and I end up struggling and frustrated. So I’ve accepted a key realization about priorities and personal time management. I have seven life categories that are most important to me. They are necessary for one reason or another, bring me pleasure or support my values, etc. Of those seven (such as career, family, hobby, etc.) , I can realistically handle five of them at a time, over the period of, say, a week. Then, I have to make sure that I rotate them all in on a weekly or bi-weekly basis, so that I don’t go too long without giving each plate a spin, so to speak. For example: I like to eat right and exercise. But if work is really busy AND friends need my time AND I’m fighting a little flu bug… well, then it’s fine to skip the gym. Or, since I’m also a big reader, if I go too long without starting a new book, I feel like I’m missing out on receiving the important nutrients that books give me — and I pick something up, even if it’s just for an hour. I asked friends on Facebook for their thoughts on maintaining balance. Another friend, blogger Jessica Rossi, wrote about it in an excellent post. 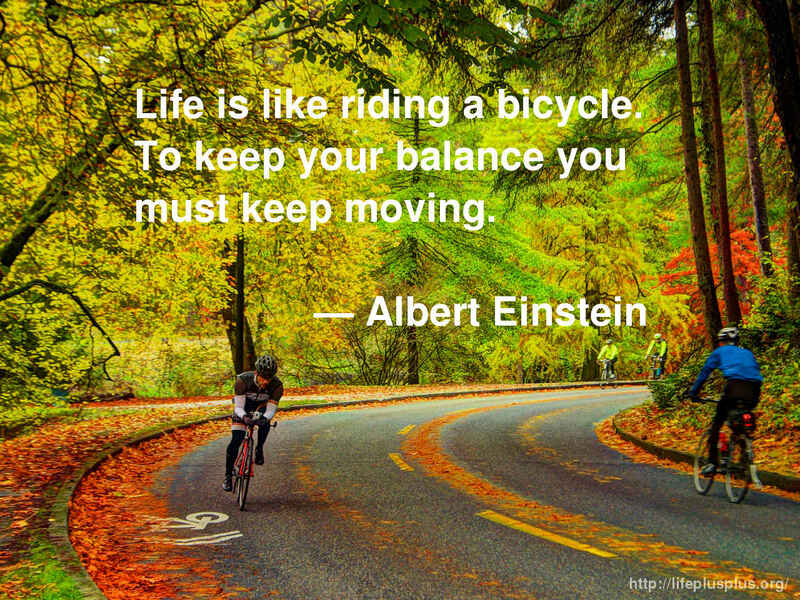 Here are 11 of their tips to keep balance in life. Send me yours and let’s keep the conversation going! This entry was posted in Atlanta, Social Media and tagged balance, Books, family, fitness, friends, healthy lifestyle, wellbeing on April 13, 2014 by Jay Croft. Josh and Rebecca recently put this Little Free Library in front of their house. Friends joined the Little Free Library movement recently and they love the interaction they’re getting with neighbors and fellow book-lovers. Just this morning, they pointed me in the direction of a handful more within a few miles of their Decatur home (including one in front of Decatur City Hall). And another friend told me about one closer to home, near Piedmont Park. 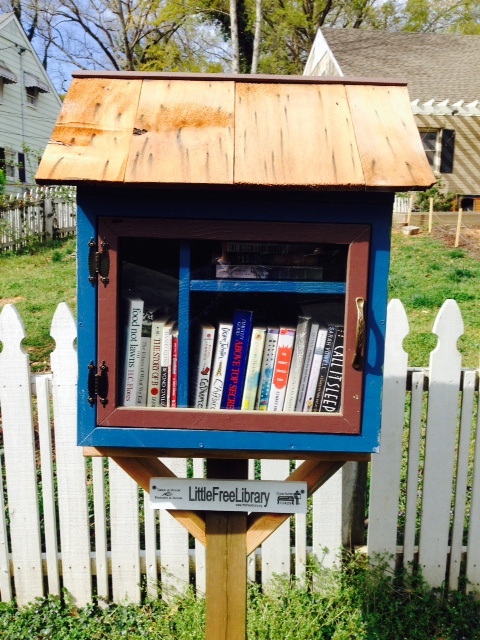 The little libraries aren’t just adorable. They’re also a great way to encourage reading (of actual books!) and build community. After all, what could be friendlier than sharing books among neighbors? It’s like social media before the Internet, and way more homey. It’s a ‘take a book, return a book’ gathering place where neighbors share their favorite literature and stories. In its most basic form, a Little Free Library is a box full of books where anyone may stop by and pick up a book (or two) and bring back another book to share. You can, too! That’s from littlefreelibrary.org, the excellent website of the excellent organization that started in Wisconsin a few years ago and has led to the creation of some 15,000 LFLs around the world — including a few dozen in metro Atlanta. Check out the site for more information, how to start your own LFL, a photo gallery and a searchable map of LFL locations. This one is in the same neighborhood near Decatur where my friends just opened their own LFL. Here’s one in front of Decatur City Hall, next to the famous Eddie’s Attic music venue. Bring some reading material by and show this guy some love. Decatur City Hall. This entry was posted in Atlanta, Entertainment and tagged Books, decatur, Eddie's Attic, Little Free Library, Reading on April 5, 2014 by Jay Croft.